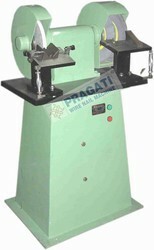 Pioneers in the industry, we offer wire nail cutter grinder from India. We have gained expertise in manufacturing, supplying and exporting a quality range of Nail Cutter Grinder. Offered range is used as a cutter tool in the nail making machine to make it blunt and cause re-grinding. All these products are used for grinding all the profiles of cutters and are available with special kind of jigs fixtures that are attached with the automatic nail cutting grinder.